Although they share a common name, the mimosa from which mimosa essential oil is extracted is Acacia dealbata, and not the tropical tree Albizia julbrizzins . Once again, it’s important when buying essential oils to make your purchase by the genus-species label so that you are certain of what you’re getting! True mimosa essential oil is extracted from the small yellow flowers of Acacia dealbata, and is used primarily to treat emotional conditions such as anxiety and depressed mood, as well as to nourish the skin . Acacia dealbata is a small evergreen tree or shrub with silver-green, bipinnate leaves and small yellow flowers whose thready petals cause them to resemble pom poms. Also called mimose, silver wattle, blue wattle, or cassie flower, this species of mimosa is native to southeastern Australia and Tasmania. It has also been naturalized to warm, Mediterranean parts of Europe . Mimosa’s fluffy yellow flowers produce a heavy concrete or absolute oil, with a scent reminiscent of honey with leathery undertones and a hint of anise. Mimosa oil also tends to be quite thick, so it can help to warm up the oil before working with it. The chemicals in mimosa oil include, in order of concentration, methyl salicylate, anisaldehyde, geraniol, nonadecane, benzaldehyde, and geranial . In its native southeast Australia and Tasmania, various parts of the mimosa including the leaves, bark, and roots have been used in traditional medicines. The leaves are used as a poultice for skin infections and wounds, as well as to treat urinary tract infections and sexually transmitted diseases. In Java, the powdered bark is used as an emetic to induce vomiting, and as an astringent in India and Costa Rica. The roots have also been employed as a tuberculosis remedy in India . Traditional medicines have focused on the whole mimosa plant, as the absolute or concrete oil was unavailable until modern methods of extraction were invented. Today, the absolute oil extracted from mimosa flowers is beginning to be incorporated into aromatherapy for emotional conditions. Mimosa essential oil is most commonly used by inhalation to address stress and stress-related conditions such as frigidity, anxiety, depression, nervous exhaustion and hypersensitivity . A small amount may also be added to a carrier oil to nourish and emolliate the skin . While mimosa oil is also commonly called cassie flower oil, be careful not to confuse this essential oil with cassia oil! Cassia is a totally different tree related to cinnamon, and its oil is considered very irritating to the skin, as well as stimulating to the emotions. In contrast, mimosa essential oil is generally non-sensitizing and non-irritating, and tends to have a balancing effect on the emotions. Inhaling a bit straight from the bottle can tamp down feelings of stress, anxiety or being out of balance. Try adding a tiny amount to a bath for a luxurious steam treatment that can soften your skin and restore a bit of healthy equilibrium at the same time! 1. Vosnaki, Elena. “Mimosa Perfume Ingredient”. Fragrantica. Accessed August 6th, 2014. http://www.fragrantica.com/notes/Mimosa-167.html. 2. 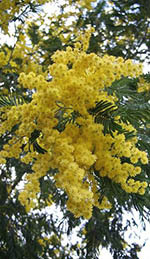 “Acacia dealbata”. Wikipedia. Last modified July 29th, 2014. http://en.wikipedia.org/wiki/Acacia_dealbata. 3. “Acacia farnesiana Willd.” Globinmed. Accessed August 6th, 2014. http://www.globinmed.com/index.php?option=com_content&view=article&id=79066:acacia-farnesiana-linn-willd. 4. Keville, Kathy. “Aromatherapy Materia Medica: Mimosa”. HealthyNet. Accessed August 6th, 2014. http://www.healthy.net/Materia_Medica/Mimosa_Acacia_decurrens_var_dealbata_Aromatherapy_Materia_Medica/54. This entry was posted in Essential Oils and tagged antidepressant essential oil, Essential Oils, skin care on January 14, 2015 by Keith Cleversley.